Chapter 25. The “Ideotype Concept” and its Application to the Selection of “AFTP” Cultivars: This chapter was previously published in Leakey, R.R.B., Page, T., 2006. Forests, Trees and Livelihoods, 16, 5–16. Having Identified Action-oriented Targets for Sustainable Intensification, Where Do We Go From Here? Roger Leakey has diplomas in practical agriculture (NDA and CDA) and degrees in agricultural science (BSc, PhD, DSc), with truly global experience of field-based research in tropical agriculture, horticulture and forestry spanning nearly 50 years. He was Director of Research at the International Centre for Research in Agroforestry (ICRAF 1993-1997) and Professor of Agroecology and Sustainable Development of James Cook University, in Cairns, Australia (2001-2006). He has been Vice President of the International Society of Tropical Foresters and is Vice Chairman of the International Tree Foundation, a UK-based charity supporting development projects in Africa. He holds a number of Fellowships in learned societies, universities and international research centres. He was a Coordinating Lead Author in the International Assessment of Agricultural Science and Technology for Development (IAASTD) which was approved by 58 governments in an Intergovernmental Plenary meeting in Johannesburg, South Africa in April 2008. 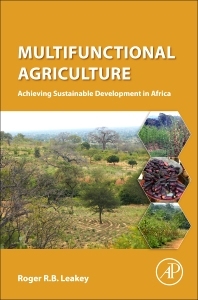 This Assessment examined the impact of agricultural knowledge, science and technology on environmentally, socially and economically sustainable development worldwide over the last 50 years and suggested that to meet these challenges agriculture has to advance from a unifunctional focus on food production and to additionally embrace more environmental, social and economic goals – i.e. to become multifunctional.